EC: An exclusive inside look at the even more exclusive LL-Release Promo Pack! Dear readers and friends of Elemental Clash! 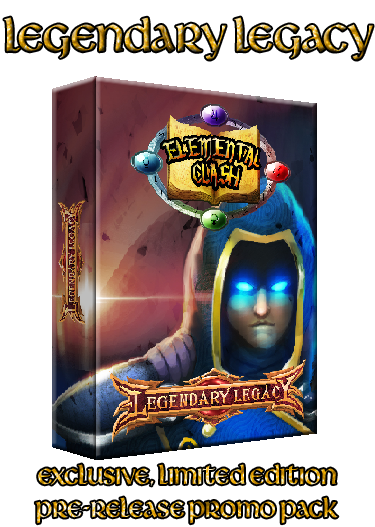 On the occasion of the release of the Elemental Clash: Legendary Legacy expansion I will be distributing a very special LL-Release Promo Card Pack containing exclusive, never before released or seen cards in a VERY limited quantity (maybe only around 10 copies will ever be printed) as part of a little raffle. How you can win your copy of the super-rare Legendary Legacy Release Promo Pack will be announced in due time, when I have all the art and have uploaded the game to The Game Crafter. Well everyone, isn’t that terribly nice of me to unveil all the cards that are going to come in the Legendary Legacy Release Promo Pack?? In any case I will announce the raffle, how it will work and how YOU can be the lucky winner of one of these highly limited Promo Packs here and on facebook as soon as I know. All shall be revealed in due time, do not fear! Hope you enjoyed the previews! If I weren’t two years too late that would’ve been awesome! I specifically like the Skeletal Dragon since it is some beautiful artwork by Andi himself.